Where are your target customers going, and how are they spending their time and, more importantly, their dollars? Location data and intelligence – not just on how consumers are interacting with your brand but also with your competitors – is key to crafting a killer consumer experience and reaching them when and where their hearts and minds (and wallets) are ready to be captured. From foot traffic patterns and location visits to frequency analysis, custom venue visit analysis offers powerful, actionable insights to companies looking for a competitive edge in a crowded field. Learn how to capture new customer interest, keep older customers coming back, and boost your market share when you join this VB Live event! Reportedly, 44% of Americans would rather scrub a toilet than call customer support. And heeding that cry for help back in 2016 or so, companies across the land stepped up to the plate, taking customer service from the phone to texting and messaging with AI-powered, NLP-reliant smart chatbots that could tell jokes, offer small talk, place taco orders, and more. Where those messenger bots fell down, though, was in actually understanding customer intent and delivering on-point customer service. So companies were left with frustrated customers who’d still rather get a root canal than talk on the phone, but left with a broken messenger-based solution that only made the experience worse. The answer: Make bots "dumber," to make customer service smarter. Simpler rules-based chatbots are easy to implement, easy to use, 99-percent effective web and mobile-based messenger apps that don't try to hold conversations — they just solve customer service issues, fast. To learn more about why companies like Amazon are dumping the NLP bots and going all-in on a new generation of rules-based chatbots, don’t miss this VB Live event! * How to deliver mobile and web-based customer service that works, using the right bots. The most accessible way to leverage the explosion in artificial intelligence is chatbots. Big brands like Western Union have implemented them to streamline customer service and increase positive engagement. The Booking.com chatbot resolves half of the company's thousands of daily customer support questions in five minutes or less. Chatbots are changing the way companies and customers interact, as consumers grow more and more comfortable with messaging -- look at the two billion-plus conversations consumers have with companies via Facebook messenger every month. 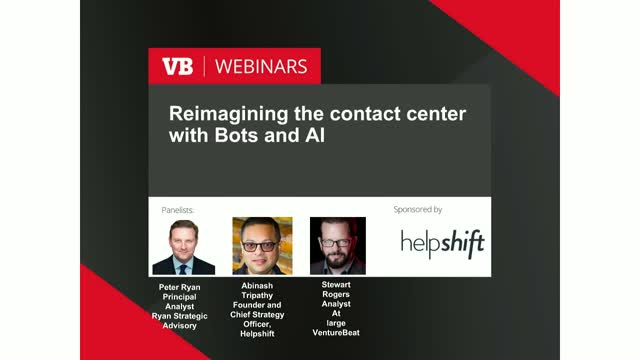 Find out how to create a powerful, engaging human-to-AI agent experience that customers expect -- as well as implement the seamless handoff to a human customer service agent when the issue turns out to be complex, with this VB Live event. You’ll dive right into the chatbot phenomenon, and leave with actionable ideas on implementing AI-powered customer support. Every company has sensitive and confidential data. it's important that we maintain data security and compliance within our retail teams and handle that data properly. It's equally important to prevent malware from infecting servers and computers and to protect the information and data coming into your organization. Learn how to ensure privacy and security of sensitive production data by managing devices and channels within and outside your organization. Discover how to improve employee performance with access to information anytime, anywhere. In this video you will learn how to share big data and collaborate with team members. We will also go over how to share documents or files without having to email colleagues back and forth. Sales enablement tools help increase sales and drive business growth. These tools help sales teams deliver the right message to their prospects at the right time. Join Microsoft as they discuss sales enablement tools that increase your sales team collaboration and productivity. Discover how businesses turn big data into meaningful insights to help make organizations work smarter, and make better decisions faster. Join Scott Dallon to learn tips on analyzing and modeling complex data sets! Discover how to zero in on the data and insights you need to make big-impact decisions quickly, without having to put in a request to the IT department. Explore how to leverage customer history and relationships to unblock opportunities and close deals quicker than ever. Please join Matthew Ferriss, Account Executive, LinkedIn, Vivek Venugopal, Account Executive, LinkedIn, Brian Mullin, SDR Manager, LinkedIn, and Dan Clay, Account Executive, Gartner, as we discuss how to improve sales enablement strategies. In recent years, spending on B2B marketing and sales technology has seen explosive growth. But sales closing rates and quota attainment have remained flat at best. What’s going on? Today’s companies are more data-driven than ever before, but in this new world of big data and increased business velocity something is clearly undermining the benefits that should come from sales and marketing investments in people, technology and process improvement. Join Branden Burdick, Manager, Marketing Development, at PeopleAdmin, as he discusses how to effectively coach and motivate your sales team. In this talk, Liz Cain, VP of Go-to-Market Strategy at OpenView Venture Partners, discusses the five key decisions that go into building a lead generation team, using case studies to discuss strategies and tactics for hiring, location, training, compensation, and structuring the division of labor. The Sales Process is the hero and main character of countless sales books and most sales training programs. It is also a shape shifting chameleon that takes on different forms, labels, acronyms, layers and complexity. Depending on the complexity and length of sales cycle the steps expand or contract with sub-steps. Yet while sales trainers and leaders drill the sales process into their salespeople they ignore they other two processes that when aligned with the sales process create serendipity. The failure to align the 3 Processes of Sales explains why so many salespeople struggle to produce predictable performance. Why, for the vast majority of salespeople, the sales process and outcomes (closing or losing the deal) seems to be completely random. Why prospects are so turned off by and seek to avoid salespeople altogether. Learn how to provide great customer success from leaders in the industry.